Come along to strut your stuff at the Bangkok Charity Dance-athon on Sunday, November 21. Thailand’s first ever charity Dance-athon will kick off next weekend with an 8 hour non-stop daytime event to raise money for two worthy causes; SCAD – the Soi Cats and Dogs Society and the Able the Disabled Foundation which offers mobility to disabled children. “Reasons to Dance” will be held in Bangkok, at the Siam Kempinski Hotel Hotel (BTS skytrain to Siam and walk behind Siam Paragon), which has donated its ballroom for the day . The Dance-athon will run from 9 a.m. until 5 p.m. on Sunday November 21 and participants can stay on for Loy Krathong dinner at the hotel for a discounted price. The dance team behind the event is Fusion Academy which is Thailand’s newest centre for dance, music and drama. Dance-athon hosts will include SCAD Ambassador Natalie Glebova, Miss Universe 2005, Raine Grady from Capital TV, and the founder of Fusion, UK celebrity Ben Douglas. 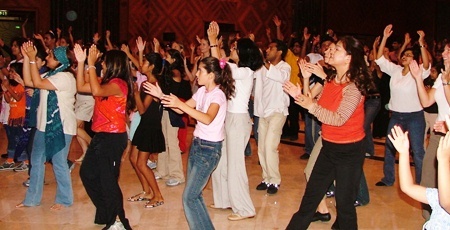 The event requires no dance skills and there are no age limits. Organizer Tami Fowlie has undertaken several charity dance-a-thons in Dubai for up to 700 attendees. She promises a fun day for the whole family. Each dancer will require a minimum sponsorship of Baht 300 to enter and can be sponsored as much as possible by friends and family. Companies can also sponsor either the event or their own dance group. There will be prizes for the best dancers, the best dressed, the youngest and the oldest and much more. Fusion Academy’s Ben Douglas will also be on the look-out for new talent, “so don’t be afraid to strut your stuff”, he said. The aim of the event is to have fun, dance and help others. Sponsorship forms and sponsor information is available on the event website: www.danceathonbkk.webs.com.